We're both big Italian food fans so I decided to make lasagna last night for dinner since he was flying back from Oklahoma. I used my lunch break to have everything prepped and ready for the oven to save time after work. I cooked up some sweet Italian sausage and mixed in chopped mushrooms for a healthy boost to the meat sauce. I then added a jar of Trader Joe's marinara sauce to the meat/mushroom pan and let the ingredients warm through. The cheese layer was a mix of ricotta cheese, Parmesan cheese, some milk, and a little shredded mozzarella, seasoned with salt, pepper, parsley, and a touch of nutmeg. I then layered everything in a 8x8" pan, starting with the cheese mixture, and then topping that with 2 no-boil lasagna noodles (best time saver EVER). 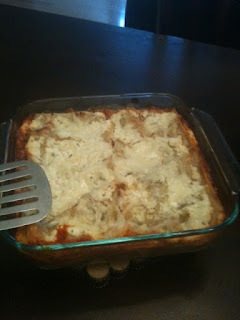 The next layer was the meat sauce mixture, sprinkled with some more Parmesan and mozzarella cheeses. 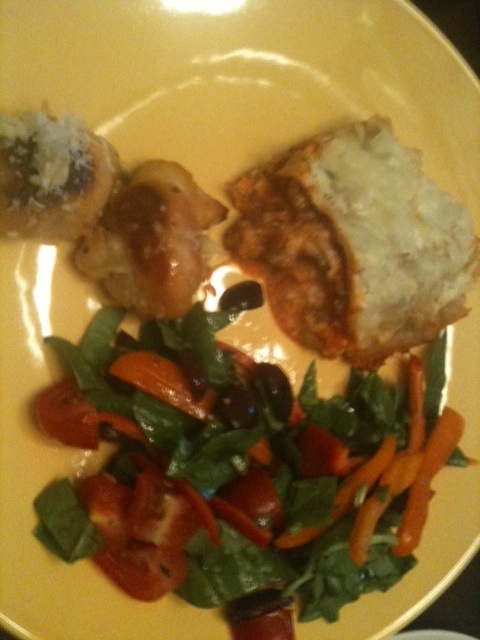 I continued layering until I was out of cheese and meat sauce. The almost finished lasagna stayed in the fridge while I was at work and then was baked in the oven for 45 minutes at 375 degrees. 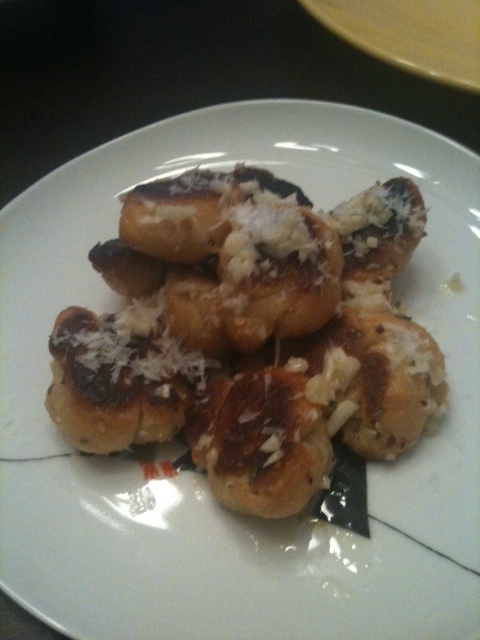 The garlic knots were super easy to make. I used one of the small cans of Pillsbury Crescent rolls. I tore each triangle in half and knotted the dough. I then baked the tray of 8 small knots in the oven for 10 minutes at 375 degrees. Once they were out of the oven I tossed the knots in a bowl with some garlic butter (3 cloves minced garlic, about 1.5 tablespoons melted butter, 1 teaspoon parsley, 1 tablespoon olive oil, and a pinch of red chili flakes for a little heat). The salad was easy to make too. I chopped some fresh spinach and quartered a handful of grape tomatoes and tossed those in a bowl. I then chopped some kalamata olives and added those to the salad bowl. I thinly sliced a couple of sweet bell peppers and added those as well. The final piece of the salad was a drizzling of red wine vinegar and olive oil as the dressing, plus a little seasoning of freshly ground salt and pepper. The best part of last night's dinner was leftovers for today!